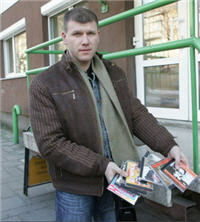 Vytas Simanavicius, president of Lithuanian anti-piracy outfit LANVA, is suspected of drug trading or unlawful possession of illegal narcotic substances in high quantities. Details on the investigation were made public by the police this week with local news sources identifying the LANVA boss as the suspect. Simanavicius, who earlier partnered with Microsoft to sue a prominent BitTorrent tracker, faces up to eight years in prison. For years LANVA has fought legal battles against BitTorrent sites and their users. However, according to a reputable Lithuanian news source, LANVA chief Vytas Simanavicius has now run into legal trouble himself. The serious nature of his alleged crimes could get him locked away for several years. The Organized Crime Investigation Board suspects Simanavicius of drug trading or unlawful possession of illegal narcotic substances in high quantities. The news follows after the local authorities launched a pre-trial investigation into the drugs trade February this year. On Thursday the Kaunas police department confirmed the investigation into drug crimes, referring to the lead suspect with the initials V.S. If convicted, the offenses could result in a two to eight year prison sentence for the anti-piracy chief. In recent years the LANVA anti-piracy group has built quite a track record when it comes to legal proceedings against BitTorrent sites and users. One BitTorrent user was eventually taken to court, but the case was dismissed due to a lack of evidence. In 2010 LANVA teamed up with software giant Microsoft again to sue the operator of LinkoManija. Microsoft demanded $43 million from the defendant and his company for assisting in the illegal distribution of its software. This case is still ongoing. LANVA has yet to comment on the allegations against its President and could not be reached for a comment.